The Musée des Beaux-Arts de Rouen, the Musée Malraux du Havre and the Musée des Beaux-Arts de Caen joined forces for the first time to organize a large-scale event. The three exhibitions, presented simultaneously in the three museums, are devoted to illustrating the Normandy region and its five administrative divisions (départements). Structured round a series of images (lithograph albums from the early 19th century, illustrated volumes of photogravure from the late 19th century and photography commissions from the 20th century), they highlight the motifs that nurtured the visual and cultural perception (or the representation) of Normandy. The exhibition retraces the development of artistic techniques (painting, lithography, photography, photogravure), as well as the changes in perception and iconographic choices (from historical and famous monuments to industrialized landscapes and reconstruction buildings). It also seeks to raise questions on the notion of picturesque over the past two centuries, from the height of its glory in the Romantic era until it was challenged in contemporary art. The exhibition at the Le Havre museum presents nearly 145 works ranging from photogravure to photography and publications. 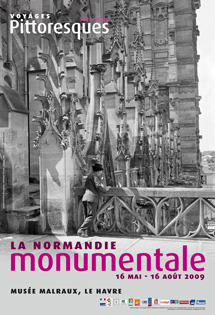 It invites viewers to discover an astonishing publication illustrated with photographs: La Normandie monumentale et pittoresque by the Le Havre-based publisher A. G. Lemâle. The photogravures, renowned for their print-like quality of half-tones and precision of detail, are compared and contrasted with the publications and their corresponding photographs, stored in the region's five departmental archives. The selection sheds light on the specific contribution and the personality of the five main photographers who participated in the Lemâle publication: Paul Robert and J. E. Durand, Emile Letellier, Henri Magron, Georges Douthwaite and Lalouette.